Hassan Khans complex and evocative multi-disciplinary artworks, including texts, films, images, sounds and objects, are comprised of both notional incidentsthe way you dash across the road, the exact distance between two shelves in a run down café, the hysterical ranting of an obsessed writer, a moment of embarrassment suddenly remembered while washing the dishesand the ordered structures of motivated meaning that are sustained in secret agreements and social coercion. 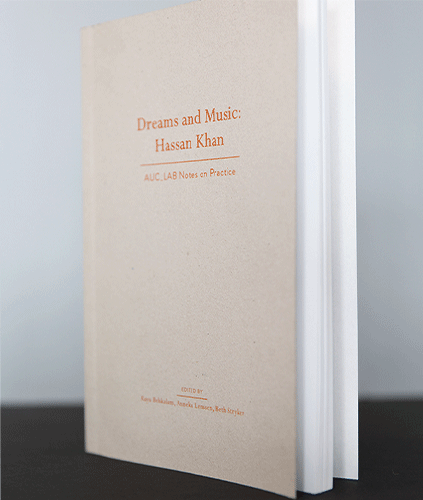 This book assesses, explores, and tests the play of two specific kinds of sources in Khans workdreams and musicand responds to their intrinsic resistance to discursive incorporation via idiosyncratic and freely associative texts and images. Nida Ghouse offers an account of dream-composition and oscillating states of no context. Sam Shalabi delivers a sequence of liner notes on Khans music, with personal commentaries on the problem of noise and musicianship, the Cairo experimental scene, and the quandary of insider/outsider dynamics. Hassan Khan is an artist, musician, and writer living in Cairo. His works have been shown at Documenta 13, Secession Vienna, SALT Istanbul, Paris Triennial, and the New Museum Triennial, among others. Dreams and Music: Hassan Khan is the second publication in the AUC_LAB Notes on Practice series, on contemporary art practices in Cairo. It is edited by Kaya Behkalam, Anneka Lenssen and Beth Stryker, with contributions by Nida Ghouse, Sam Shalabi, Anneka Lenssen, Kaya Behkalam, and Beth Stryker.